Heat the oil in a large saucepan over medium high heat. Prepare the sofrito, which is the Cuban trinity, consisting of the onions and bell peppers. Saute until softened and tender, about 5 to 7 minutes. Add the garlic, and cook for 1 minute until fragrant. Add ground beef and ground pork to the pan and cook until no longer pink. Make sure to mash any big pieces down. Add the cumin, cumin seeds, complete seasoning, tomato sauce, tomato paste, dry white wine vinegar, bay leaves, pimentos and raisins. Stir to combine. Bring heat to a low simmer and cook until picadillo thickens, stirring occasionally, about 10 minutes. Season to taste with salt and pepper. Add the chopped cilantro and discard the bay leaves. Set aside to cool. Prepare the Avocado Mojo sauce. Puree the cilantro and garlic in a food processor until smooth. Add the mayonnaise, avocado, buttermilk, Greek yogurt, lime zest, and lime juice. Puree until fully combined. Add salt and pepper and mix again. Preheat the oven to 350 degrees. Line baking sheets with parchment paper or silicone baking mat. Lay out a sheet of puff pastry on a lightly floured surface. Flour the top of the dough and roll out the puff pastry until it is about 1/16-inch thick. Cut 4-inch strips crosswise and lengthwise making 12 (4x4) squares. Make sure the squares are well floured. In a small bowl, mix the egg with a teaspoon of water and mix until fully combined. 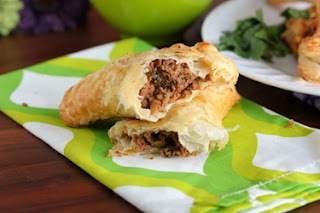 Place a heaping teaspoon of picadillo filling onto the floured squares. Dip finger into the egg mixture and moisten the edges of the top half with the egg mixture. Fold the bottom half to meet the edges of the top half. Use a fork to crimp and seal the edges together. Lightly brush the tops with the egg mixture and poke a couple fork openings on top. Repeat process for the remaining squares until finished. Place finished pockets on prepared baking sheet.